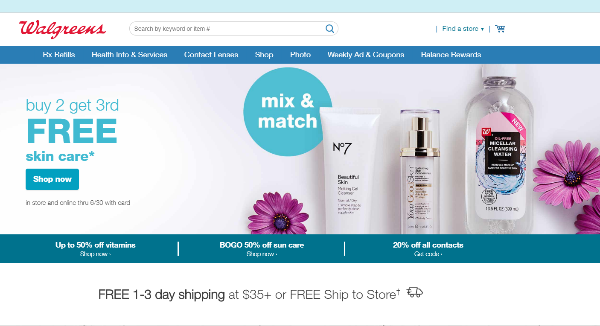 Sign up for free and just shop with Walgreens as normal. Our average member earns over $450 cashback a year. Please note; cash back is not eligible on the purchase of Pharmacy, Prescription Drugs,Household, Diet & Fitness, Grocery & Household or the purchase or redemption of gift cards. Extra 15% off Shea Moisture on $40+ Orders. Extra 15% off Shea Moisture on $40+ Orders. 60% off 11x14 Metal Panels + Free Same Day Pickup. 60% off 11x14 Metal Panels + Free Same Day Pickup. 50% off Photo Cards and Premium Stationery + Free Same Day Pickup. 50% off Photo Cards and Premium Stationery + Free Same Day Pickup. Extra 15% off Shea Moisture on orders $40+ with code SPRINGFEVER. Extra 15% off Shea Moisture on orders $40+ with code SPRINGFEVER. $5 off select Allergy Relief Products when you spend $30+. $5 off select Allergy Relief Products when you spend $30+. $5 off select Pain Relief when you spend $25+. $5 off select Pain Relief when you spend $25+. 65% off Same Day Pickup Metal Panels and Wood Panels + Free Same Day Pickup. 65% off Same Day Pickup Metal Panels and Wood Panels + Free Same Day Pickup. 40% off Prints, Posters and Enlargements + Free Same Day Pickup. 40% off Prints, Posters and Enlargements + Free Same Day Pickup. 40% off Photo Cards and Gifts + Free Same Day Pickup. 40% off Photo Cards and Gifts + Free Same Day Pickup. 50% off Canvas Prints + Free Same Day Pickup. 50% off Canvas Prints + Free Same Day Pickup. The purchase of Pharmacy, Prescription Drugs,Household, Diet & Fitness, Grocery & Household or the purchase or redemption of gift cards. Only purchases made on Walgreens's US site are eligible for cash back. Walgreens has all your everyday essentials. You'll find canvas prints and enlargements, painting books, orthotic inserts, poster supplies, photo gifts and more. Stock up on mobile hardware, vitamins, eye health supplements and custom floating frames. Scoop up gorgeous cosmetics, like Wet n Wild MegaLast Liquid Catsuit lipstick in video vixen and rejuvenating beauty products, like Soap & Glory Speed Plump moisture mask. Sign up for Balance Rewards to snag all kinds of cool perks, and get free shipping whenever you spend $35 or more. Save even more moolah with our Walgreens coupons and cash back rates. Just sign up for a TopCashback membership through the brief form at the bottom of this page to find the best deals. Walgreens has a diverse range of products. From medical and healthcare merchandise to electric toothbrushes, they've got it all. The Optic Shop plastic sunglasses companion is great for driving or hanging outside in summer. It keeps the sun out of your eyes. And the L'Oreal Paris Voluminous Lash Paradise washable mascara in 200 blackest black will sculpt and highlight your lashes. And speaking of the ol' peepers, Walgreens carries some of the best contact lenses brands. Some big names include Avaira Vitality and Bausch + Lomb. If you're interested in the latter, check out Bausch + Lomb Biotrue and Bausch + Lomb ULTRA. In addition to prescription goods, you'll also find practical essentials. They have a wide variety of deodorants, and the Lady Speed Stick line is one of the best-sellers. The Dixie paper plates come in handy when you're hosting a party or preparing grab-and-go meals. Moving on to the Photo department, photo cubes make excellent birthday gifts. You can also personalize books with precious Kodak moments. Save big with our Walgreens promo codes. Just select the "Click to Reveal" button underneath an offer on our Walgreens merchant page to see the voucher. You can also find promo codes on Walgreens Paperless Coupons and Deals pages. If you scroll down the latter, you'll find Walgreen's photo coupons. In 2018, they gave 50% off prints, posters & enlargements. They also offered 50% off canvas prints & custom floating frames and $2 off passport & ID photos. With amazing deals like these, you know you can find more fantastic ways to save in the future. Check out Walgreen's Weekly Ad for the latest discounts. Snag free in-store pickup by selecting the Ship-to-Store option at checkout. Just search for a "Walgreens near me," and then they'll send your package to the preferred brick and mortar location. You'll receive an email once your products are ready for pickup. Score free Standard shipping whenever you spend $35 or more. If you can't wait to get your paws on your goodies, you can choose faster delivery options, like Expedited and Overnight for a fee. Sign up for Balance Rewards to score all kinds of neat perks. You'll get the chance to earn points on your purchase, and they can be traded in for cash rewards. 1,000 points will lead to $1, and 40,00 points will get you a $50 bonus. In addition to accruing points through transactions, Walgreens also lets you earn them through exercise. You'll score 20 points when you hit 20 miles through cardio, and you'll snag the same amount when you receive blood pressure tests, weight examinations, blood tests and more. And if that's not cool enough, Walgreens wants their customers to live a long, smoke-free life. So they're giving away points to whoever quits tobacco. Walgreens provides the most convenient access to consumer goods and services, and pharmacy, health and wellness services, in America. It is transforming into a more efficient and customer-focused company, both for drugstore customers and for patients and payers seeking quality pharmacy, health and wellness services that are accessible and affordable. Walgreens' breadth of product includes photo, baby, beauty, contact lens, diet & fitness, electronics, healthcare, home medical, vitamin categories and more.